Add Neck Strap with Transmitter? I do NOT want this to be adapted to accept a switch. Our wireless attendant call button system can be used as-is or with an optional standard 1/8" (3.5mm) switch plugged into the transmitter for activation by those with poor or no finger use. Perfect for the caregiver who needs to go out in the yard, do laundry, or simply run to the mailbox. Includes an A/C plug in receiver chime for indoor use, a battery operated portable receiver chime, and a switch adapted transmitter. 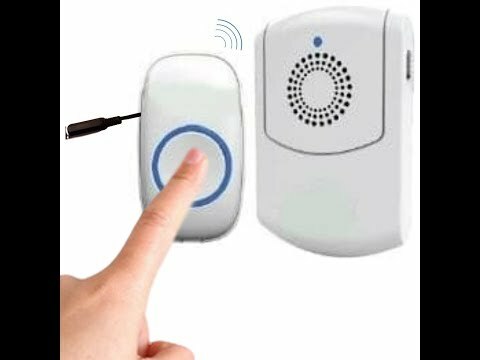 This alert signal travels up to 500 feet* through doors and walls in a normal house environment. Receiver has 52 ringtones, vibration, and 4 volume levels (from a soft 25 dB up to 110 dB). Built-in belt clip for easy hands-free chime transport by clipping it to your clothing. Multiple units can be used within the same environment using easy chime programming. Each user has their own chime sound assigned. Directions to pair transmitters can be found on the video on this page and in the instructional pamphlet included with the product. Requires 2 "AAA" batteries (not included) and 1 12-volt battery (included). Optional switch (not included) is recommended for people with little or no finger dexterity or progressive diseases such as ALS. This product is not intended to replace direct supervision of the user or be used for emergency situations. Replacement batteries are available here. Add a Call Button with Neck Strap to allow users with good hand function to wear a separate transmitter around their neck. This transmitter is not adapted for switch use. *may vary slightly due to building construction. Travels up to 1000 feet in an open air environment. Users manual can be downloaded here. Compatible with all of our switches. Click the red button to view our switch selection.